Stone Brother & Byrd opened its doors in 1914 with the mission to serve the needs of the Durham area’s small farmers. Seed, fertilizer and small machinery were sold and often bartered, and credit was extended to provide farmers time to sell their crops before payment was due. Remembering the old days, at the age of 83 Mr. H. R. Byrd in 1977 said, “We sold wagons and buggies, harness, mowing machines, churns, stoves, harrows and a lot of supplies for the garden and farm. We would swap merchandise for corn, wheat and chickens. We handled a world of country meat, wheat, oats and eggs.” The business served a need in the Durham community and it prospered. Farmers felt a kinship with the Stone brothers and Mr. Byrd due to the caring service and excellent products. By the late 1960’s, a modern facility was built to offer drive-through service, which allowed farmers to pull their trucks into a loading area. Every aspect of the buying experience was thought about by the astute observers of retailing science when planning the new location, from chairs being provided for customers in the sales room for resting and conversing, to accommodating the changing demographic of shoppers. “A thing we kept in mind when planning our location is that women are doing more and more of the shopping in our line of merchandise, and we wanted our place to be attractive and convenient for them to come in and shop,” said Mr. Robert Bullard in March of 1969 as quoted in Feedstuffs, a weekly newspaper for agribusiness. The reins of Stone Brothers & Byrd were transferred in 1976 to George Davis, a consummate “gentleman farmer” with a strong knowledge of horticulture and an uncanny ability to connect with customers. “George Davis posts himself at the threshold of Stone Bros. & Byrd, his old-fashioned lawn-and-garden center near downtown, eager to meet the “dirt people.” That’s what he calls his loyal customers, the ones who come into the 85-year-old store and are greeted by name. He seems to know their lawns even better,” says Kaitlin Gurney in The News & Observer in November of 1999, after George and Stone Bros. & Byrd earned the Outstanding Downtown Merchant of the Year award for Durham, NC. “It’s his combination of service, knowledge and ingenuity that earned Davis..the award. He knows his customers by name and identifies market niches” the article states. 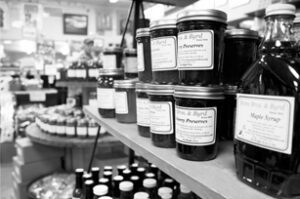 “Country hams and sausages hang from the ceiling next to jars of old-time candy sticks and barrels of homemade molasses. Large wooden bins full of vegetable seeds line the walls. In the spring, seeds are sold just as they were when the feed store opened 85 years ago. But in the adjoining room, exotic hothouse plants are nurtured next to build-it-yourself pond kits and the latest in fertilizer technology,” says Gurney. For almost a century, Stone Bros. & Byrd has maintained the most important customs from its history: providing stellar service and top-quality products.